OSWEGO, NY – It was beginning to look a lot like Christmas. But then the rains came and then more snow. A mix of sun and clouds with a high near 40 degrees and the chance of rain will do little to dampen the Port City’s holiday spirit on Saturday (December 1), however. Horse-drawn wagon ride is one of the popular activities at the annual event. 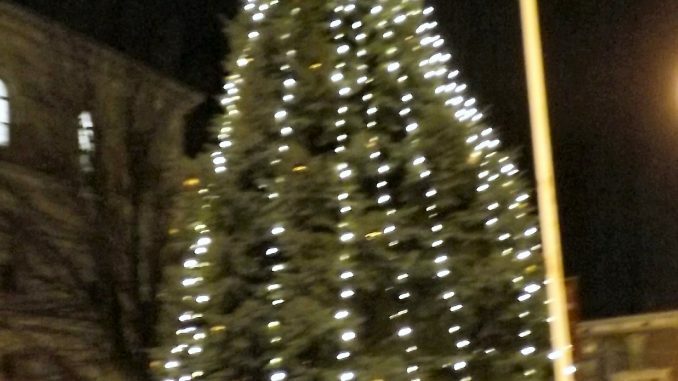 Oswego will host its 31st annual tree lighting event, “An Oswego Christmas,” at Civic Plaza on December 1 from 1 to 6:30 p.m.
Jennifer Losurdo, of the Oswego City-County Youth Bureau, has worked tirelessly for months organizing the event. She and a cadre of elves have been preparing all the details while the city’s DPW was charged with ensuring Civic Plaza and the surrounding area was dressed in its holiday best. Losurdo filled more than 400 goody bags with treats to present to children after they share their Christmas iwsh list with Santa. Members of the Lions Club will be giving out free cookies and hot cocoa inside City Hall after the children visit with St. Nick, Losurdo said..
Oswego Federal Credit Union and Wal-Mart donated gift cards to the story and coloring winners, she added. A full day of family activities are scheduled including a live ice sculpture demonstration, a children’s train ride, horse-drawn carriage rides, multiple stage performances, a children’s parade, pictures with Santa, the lighting of the tree and fireworks over the river. Activities get under way at 1 p.m. with the opening of the train ride, two children’s games and the first stage performance – Kay Burke. 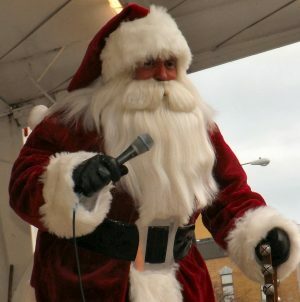 The children’s parade, led by Santa with the Oswego City Fire and Police departments escorting the participants, will start at 2 p.m. in front of the Elks Club on West Fifth Street. 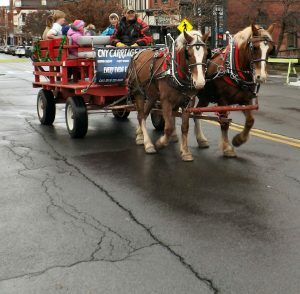 The parade route will go down West Fifth Street to Oneida and end at Civic Plaza, where Santa will greet children and then head into City Hall for pictures until 5:15 p.m. The live ice sculpture demonstration begins at 2 p.m. along with the horse drawn carriage rides. The day continues with performances from the Oswego Players, the Charles E. Riley Chorus, “Elvis Presley” and Creation Studios. Throughout the day, food vendors will be available, Boy Scout Troop 888 will be selling snacks, the Wolf Den from Cub Scout Pack 885 will be holding a can food drive in support of the Human Concerns Center and music will be provided by Just Push Play Productions. The H. Lee White Maritime Museum will also be open from 1 – 5 p.m.
At 5:15 p.m., Mayor Billy Barlow will welcome the crowd. Then, the poetry and coloring contest winners will be announced; followed by a reading of the classic “T’was the Night Before Christmas” by children’s author Kevin Caraccioli. The lighting of the city’s tree is scheduled for 6 p.m. The evening will be capped off with a fireworks display by Pyrotecnico. I was under the impression Christmas in Oswego was the second Saturday in December. I was wondering why it was the first Saturday this year ? hi, it was changed due to Thanksgiving being so early this year and the holiday weekend is tough for many people to attend as they are out of town. WOW!!!! Mr.Mayor what a wonderful time we had at the Christmas Tree Event. You have brought such Brightness to Oswego. Thank you!! !